This was an amazing spin-off from my work with BBC 'Country Tracks' - the Dean from Hull University Business School (HUBS) saw me on the programme and appointed me as their Writer-in-Residence. I helped students and staff at HUBS to tell their stories, give feedback, tutor and perform in a whole range of creative ways. This was a fabulous opportunity to work with a world-renowned Business School in a completely new way, and together we discovered all sorts of innovative ways of connecting that can be used across academia and business. Centre-page spread about my work - see Page 6 of this mag. The FT (Financial Times) heard about the work I was doing, and interviewed me not just once, but twice - about it. For HUBS Annual Staff Conference, I ran well-attended writing workshops on Improving Academic Writing which involved - amongst other things - writing a love poem using only business jargon terms! 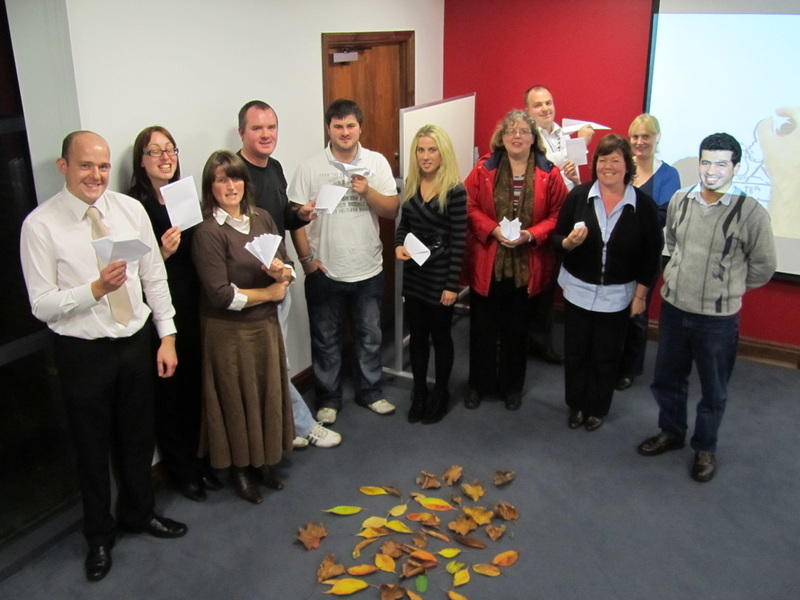 The photo below shows one of the many groups of students I worked - the leaves on the floor represent their own personal voices (they told wonderful stories about why they chose each particular leaf/voice! ), and the paper sculptures represent how they see themselves as creative people. I worked to encourage BA, MA, MSc, MBA and PhD students to use creativity more in their academic work, and their future business lives. I also worked with HUBS communications team to look at how to promote HUBS creatively, and how to show HUBS is taking the need for creativity seriously - especially in the current financial meltdown. We did all sorts of wildly creative things together, and the feedback from students and staff was fabulously positive. It's soooo great to work with an organisation that has a very open door to looking at creativity, doing things in different ways, and encouraging their staff and students to develop their own - unique - voices. A huge WELL DONE to Dr Barbara Allen (who was at that time Dean - now moved to Westminster Bus. Schl as Dean there) for realising the potential for a business school in having a creative writer like me working with them to help them deal creatively with the chaos of the business and financial markets. HUBS, she took me on a tour of the Business School, and I spotted autumn leaves - blown in by the gales - dancing down the corridor... we both thought this was a great metaphor for bringing creative-thinking into a business environment!